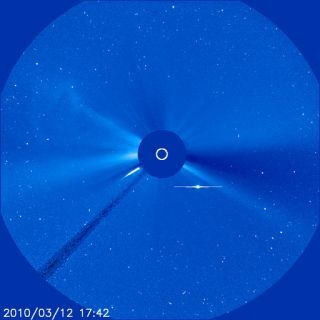 This SOHO image taken on March 12, 2010 clearly shows a sun-grazing comet closing in on the sun and headed for an encounter it will likely not survive. The sun's glare is blotted out by a disk in this view, which was taken by SOHO's LASCO 3 instrument. For 10 days in December, a mob of icy comets pelted the sun in an extraordinary cosmic storm. Scientists who monitored the solar tempest now think the flurry of sundiving comets might herald a much bigger comet to come – one that could potentially be visible to the naked eye. "The storm began on Dec. 13th and ended on the 22nd," Karl Battams of the Naval Research Lab in Washington, D.C., said in a statement. "During that time, the Solar and Heliospheric Observatory (SOHO) detected 25 comets diving into the sun. It was crazy!" These sundiving comets, known as sungrazers, are not altogether uncommon. In fact, the sun-circling SOHO spacecraft will usually see one plunge into the sun and disintegrate every few days. "But 25 comets in just ten days, that's unprecedented," Battams said. "The comets were 10-meter class objects, about the size of a room or a house," said Matthew Knight of the Lowell Observatory in Flagstaff, Ariz. "As comets go, these are considered small." The SOHO spacecraft's coronagraph uses an opaque disk to block the glare of the sun, creating something similar to an artificial eclipse. This helps to reveal faint objects that Earth-bound telescopes cannot detect. Amateur astronomers around the world can then closely analyze the images from SOHO to search for new comets. SOHO was launched in 1996, and since that time, has found more than 2,000 comets, which is a record for any astronomer or space mission. Scientists think the recent sundiving comet storm could be a signal that a much larger sungrazer is to come, one that people might be able to see with the naked eye even during the day. "It's just a matter of time," Battams said. "We know there are some big ones out there." After all, similar occurrences have happened before. In 1965, Comet Ikeya-Seki appeared out of nowhere, dove toward the sun and skimmed the surface from a height of only about 280,000 miles (450,000 kilometers). Since Ikeya-Seki's nucleus is relatively large (about 3 miles or 5 km wide), it survived the encounter and emerged as one of the brightest comets of the past thousand years. People in Japan were able to see it in broad daylight right beside the morning sun, and they watched as the comet fell into at least three pieces before receding back into the solar system. Other sungrazing comets were observed in 1843, 1882, 1963 and 1970. These sundiving comets are related to one another, and astronomers classify them as part of the "Kreutz family," named after the 19th century astronomer Heinrich Kreutz, who first studied them as a group. All Kreutz comets are thought to be the remains of one giant comet that broke apart several centuries ago. But whether Comet Ikeya-Seki's spectacular dive came after a storm like the one in December remains unknown. "We have not seen a really big Kreutz comet in the era of space-based coronagraphs," Knight said. "SOHO wasn't around in 1965 to record how many little comets dove into the sun before Ikeya-Seki. It might be 200 comets per year – or it could be 1,000. Without more information, we can't know for sure how soon we might be privileged to see one of the real monsters."